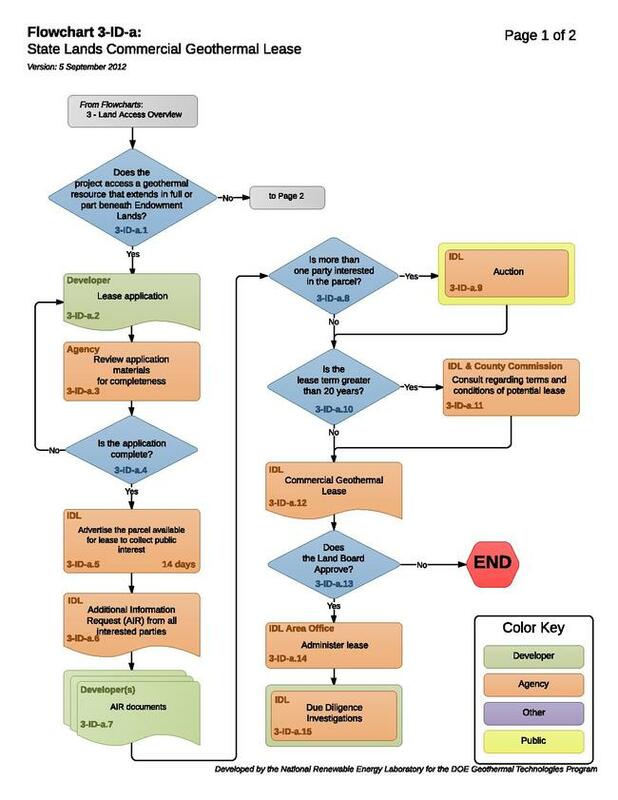 This flow chart assumes the developer is seeking to develop geothermal resources on state lands. The Idaho Department of Lands (IDL) is well-equipped to lease geothermal resources with a well established leasing process for endowment lands. Geothermal leases are available through over-the-counter filing of applications on a first come, first served basis. If two or more applications are received at the same time on the same day, it is considered a simultaneous filing which will be resolved by competitive auction. The price of annual rental is negotiated separately for each lease. And royalties are assessed by the board of land commissioners based on market value. The statutory authority for rents and royalties is found at Geothermal Resources 47-1605. A $2,000 bond is required to hold each lease. This bond must be increased to $10,000 prior to drilling a geothermal well 1000 feet or deeper. Additional bonding is required under a drilling permit issued by the Idaho Department of Water Resources. The IDL is responsible for ensuring a return on endowment lands. The endowment lands are lands held for the benefit of public schools. If the project is pursuing geothermal development on endowment lands there is a particular process. If the project is being developed on state lands owned or managed by a particular foundation or other state agency, the process is different. 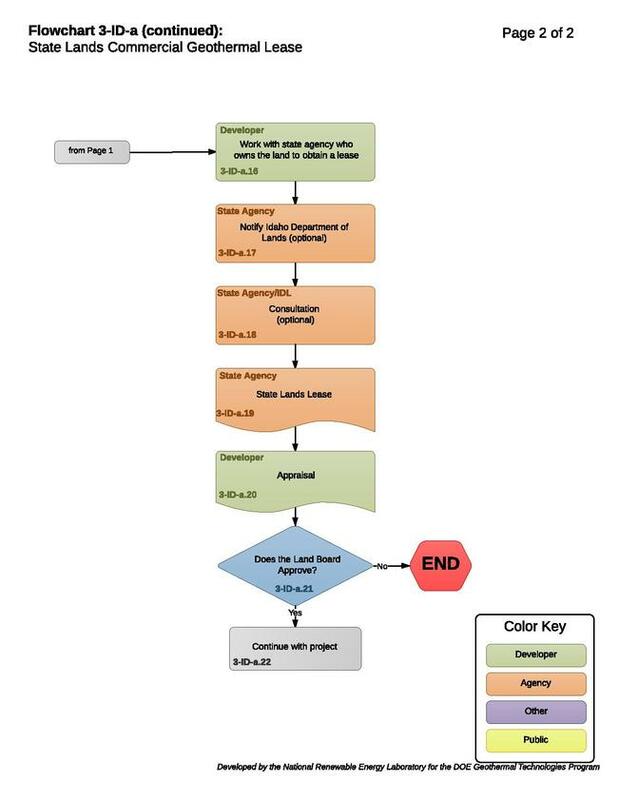 In the event the state lands are held by a foundation or other state agency, the IDL becomes involved only if they are notified and the Land Board requests their involvement. IDL may meet with any other state agency to negotiate favorable terms for the state lands lease. The state lands lease may take any variety of forms depending on the outcome of the negotiations. The Idaho State Board of Land Commissioners must approve the state lease. The board's authority is contained within Article IX, Section 8 of Idaho's Constitution. Once the Land Board has approved the lease, the developer may proceed with the project. If the developer seeks to site the project on endowment lands, a form of public notice must be made. This is to ensure that other developers have had ample opportunity to voice interest in the lands. The purpose is to ensure maximum financial return to endowment institutions. If more than one party voices interest in the parcel, the IDL must auction the parcel to the highest bidder. The purpose of the auction is to ensure a fair price for the benefit of the endowment institutions. The auctions are often silent auctions conducted orally. An interested bidder must submit the required earnest money deposit in the form of a bank-issued check, such as a cashier's check or certified check, in U. S. dollars, payable to the State of Idaho, Department of Lands at the time of auction in order to become a qualified bidder. The earnest money from the successful bidder will be considered earned and becomes non-refundable liquidated damages in the event of the purchaser’s default. Bidders must be 18 years of age and must be citizens of the United States or must have declared their intention to become U.S. citizens. A bidder will be required to sign an affidavit signifying that they have not exceeded the 320-acre lifetime limitation of state endowment land purchase of which no more than 160 acres can be University Endowment land. If the bidder is represented by another person, the representative must have a signed and notarized Verification of Bidder’s Representation form from the purchaser, along with U.S.-approved picture identification. Bidders must provide the Department with proof of financial ability to pay full purchase price at closing, five (5) working days prior to date of the auction. Acceptable proof of such financial ability shall be: (1) A letter from a financial institute clarifying bidders prequalification to place a bid at no less than appraised value or (2) A cash (or cash equivalent) deposit of the full appraise value, less the amount of bidders deposit with the Idaho Department of Lands. The successful bidder will be responsible for all cost of sale including appraisal, advertising, closing costs and title insurance premiums. The successful bidder will provide payment for appraisal and advertising costs at the close of the auction. Personal checks will be accepted for any amounts due over the original deposit to cover these incidental expenses. If the lease term is for greater than 20 years, the IDL must consult with the county commission(s) potentially affected by the lease. The commissions do not have the authority to stop a land lease, but their opinions are highly persuasive. The IDL may also consult the affected county commission for recommendations for terms and conditions of the lease that may satisfy local government concerns. In Idaho, a geothermal lease is a standard form or template. The lease is essentially split into phases. Phase I is the exploration phase. It is scheduled to last 5 years. Phase II of the lease is the development phase, which is scheduled to last 5 years. Phase III is operation and administration. The IDL area office is responsible for administering the lease. The intent of the phases is to avoid speculation. Leases on endowment lands may not exceed 49 years. During an open meeting the Land Board considers the proposed lease and votes on whether or not to approve the lease. The IDL area office is responsible for administering the terms of the lease. Once the lease is approved, the developer may initiate phase I of the lease and begin exploration activities. Part of exploration is not only determining the adequacy of the geothermal resource for development, but also to determine the appropriateness of the site selection. For instance, the developer must investigate environmental impacts and methods of mitigation. There is no formal investigatory and consultation requirement, but all environmental and cultural concerns should be considered and mitigated if possible. The IDL has an advisory role in development on "state maintained" lands. There are cases in which the lands sought for lease are state lands, but not managed by the IDL. The state agency managing the lands may seek IDL assistance, but notification and consultation are not required. Occasionally, before the Idaho State Board of Land Commissioners reviews the lease, it will request an opinion from IDL. The individual state agency is not required to utilize IDL's Geothermal Lease Template, but may choose to use its terms for simplicity of negotiation and board approval. In order for the Idaho State Board of Land Commissioners to properly evaluate a new land use or sale, there must be an appraisal before submitting the project to the board for consideration. The Idaho State Board of Land Commissioners must approve new uses of state maintained lands. This page was last modified on 17 August 2018, at 19:43.